Flooring and wooden joist beams from 1872 were removed during the renovation at the Church of Notre Dame. A new floor was laid once the wooden joists were replaced with steel support beams, and new plumbing, electrical, heating and ventilation were installed. From a 16-foot x 18-foot log structure to a magnificent stone house of worship sitting atop a hill towering over the city, the Church of Notre Dame has maintained a commanding presence in Chippewa Falls since 1856. Built in 1872 to replace the original log church, the mother church of the Chippewa Valley recently underwent a massive renovation. 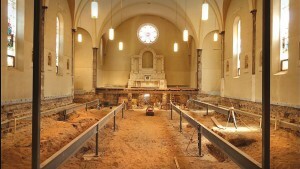 Reconstruction began below ground and didn’t stop until renovators hit the ceiling. The floor was ripped out and dirt excavated to remove the original wooden floor beams to accommodate new steel floor joists. New plumbing, heating, ventilation and electrical systems were installed throughout the building, with an updated mechanical room relocated underground beneath the sanctuary. Cracked plaster was replaced and new flooring, pews and lighting were installed. The choir loft and interior layout were reconfigured, along with many other improvements. During the 10 months of renovations, parishioners could not worship in the church many families have called home for generations. 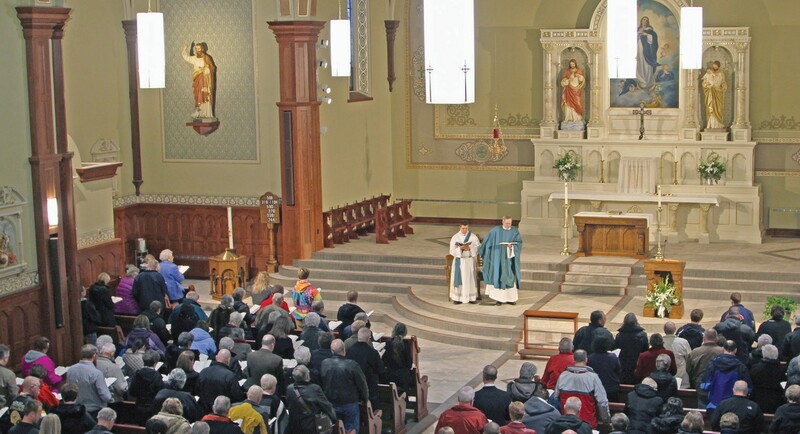 Mass was celebrated in the Parish Life Center or the neighboring Heyde Center for the Arts — the latter of which was the original McDonell High School until 1968. The heritage of the parish dates back to the mid-1800s, when logging dominated the area. The initial log structure served Irish, French, Scottish, Polish and German settlers. In 1869, Father Charles Goldsmith came to Chippewa Falls and plans were put in motion to erect a new suitable church. Huge sandstone blocks were hauled by horses from a nearby quarry located in present-day Irvine Park. It took two years to construct the large church, which was completed in 1872. Father Goldsmith died in 1890, and a memorial chapel was constructed on the church grounds in 1894, where his remains lie buried beneath the altar. Changes and improvements to the large church were made throughout the years, but the exterior of the original 145-year-old structure remains. The inspiration that Father Goldsmith had in 1869 continues today. Jerre Eckes is a member of the Renovation Committee, which put years of planning into making sure the structural and aesthetic changes would not only carry on the tradition of the parish, but move it forward for future generations to worship in. Eckes and fellow committee members worked with architects and contractors to study the needs to make prudent decisions regarding the $2 million renovation. The “Honoring our Past … Providing for our Future” capital campaign raised enough funds to complete the renovation without incurring any debt.